Next Sale Dates : April 20th, May 4th & 18. The 1st & 3rd SATURDAYS OF THE MONTH! FRIDAYS PRIOR TO SALE 10:00 am to 7:00 pm. We are raffling off Prizes and more during the auctions! Will be available on the Friday before the auction. WE ACCEPT CASH, MASTERCARD, VISA, AMERICAN EXPRESS OR DISCOVER CARD TO PAY OFF THE REMAINING BALANCE. 1) Buyer is the Bidder. 2) Lot is the item for sale. 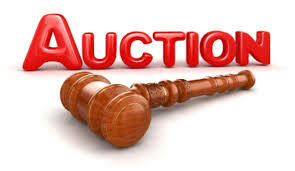 3) Auction Company is TPAA, LTD dba Trinity Public Auto Auction. The Auction Company requires that all bidders register prior to the Auction. You must be at least 18 years of age to receive a bidder number. At registration the Auction Company requires a $200.00 CASH deposit to obtain a bidder number (refundable if there is no purchase). Cash, MasterCard, Visa, American Express or Discover Card will be accepted for payment exceeding the cash deposit. The Auction Company also requires a driver’s license, State ID, US Government ID or a passport as identification. For every $2000.00 spent by the bidder, another $200.00 deposit is required. The applicable buyer's premium (see buyer’s premium table) and a $87.50 processing fee ($50.00 for licensed automobile dealers). State fees will be collected on each lot unless a current automobile dealers license and surety bond is on file with our office or if the buyer is exporting the vehicle(s) out of Texas. The sales price of a lot added to the buyer’s premium is the total sale price of the lot. Payment of buyer’s purchases may be paid in full the day of the sale or a minimum non-refundable deposit of 25% will be acceptable with the balance due the following banking work day by 6:00 pm. The lot must be paid in full to remove any lot from the Auction Company's property or location. If the buyer does not pay for his/her purchase(s) during the aforementioned hours, their lot will become the property of the original owner and forfeit to the Auction Company all monies deposited towards their purchase. At the time of sale, the buyer's number and sales price of the lot sold is announced by the Auctioneer. A verbal contract is consummated and liability for the item(s) rests with the buyer to include payment thereof. No changes in the price or quantity can be made by anyone but the Auctioneer. In any disputes over price, quantity or tie bids between bidders, the Auctioneer reserves the right to settle any and all such disputes and his/her decision shall be final. Each lot is sold, "AS IS, WHERE IS, WITH NO WARRANTY OR GUARANTEE EXPRESSED OR IMPLIED", and "ALL SALES ARE FINAL". Bidders are responsible for closely checking each lot he/she is bidding on. The bidder understands that he/she is buying the property entirely upon his or her own opinion. Expressly disclaimed is any warranty or merchantability or fitness for any particular purpose or use on any lot sold. Any information or description of lots sold is provided as a courtesy only and is believed to be accurate, but is not guaranteed. The Auction Company strongly suggests that all vehicles be towed to a qualified mechanic and examined to determine if the vehicle is worthy of being used for its intended purpose. Announcements made by the Auction Company or Auctioneer on the day of the sale take precedence over any printed or verbal matter pertaining to this auction. All title guarantees are between the buyer and seller and the loss or lack of the title is not the responsibility of the Auction Company or Auctioneer . Lots can only be removed from the Auction Company's property or location with a "Paid In Full" receipt. If the lots are not removed by 6:00 pm the first banking day after the auction, there will be a $30.00 per day storage fee assessed against the lot. The Auction Company ane Auctioneer are not responsible or libel for damage to lots that are consigned or sold. The Auction Company and its employees reserve the right to bid on lots offered for auction. Trinity Public Auto Auction is not an absolute auction. All lots are called sold by the Auctioneer. Consignors or their agents are allowed to bid on and buy back their own lots. If the consignor buys back their own lot, there will be a buyback fee assessed. All other fees and premiums will not be charged. All purchases become the responsibility of the buyer when the Auctioneer says sold and gets their bidder number. The Auctioneer cannot be involved in trading or selling of a lot between buyers. There will be a $50.00 charge for changing bidder information on any lot. The Auction Company is not responsible for loss, theft, or damage to any lot sold including the loss of keys or titles of lots. The Auction Company is not responsible for accidents on or off its property or sale location. ALL VEHICLES will be sold as Title Transfer only, TPAA, LTD will only transfer the title into buyer's name; the title will then be mailed by the Texas Department of Motor Vehicles to the buyer. The buyer is responsible for obtaining a Texas State Inspection immediately, then must obtain the metal plates and registration sticker from their local tax office after receiving their title. Selling vehicles by auction since 1998. Q: Is Trinity Public Auto Auction open to the public? A: Yes. You do not need a Dealer License to buy a car. If you can't wait for the auction, we also have a CASH CAR LOT. These cars available for sale TODAY at deep discounts. Cash Lot Hours are: Monday - Friday from 10:00 am to 7:00 pm and on Saturdays from 10:00 am to 6:00 pm. Q: When are your auctions? A: 1st & 3rd Saturdays of the month. Gates open at 10:00 am and the auction starts around 11:00 am. You must register at our office before every auction. We are located at 241 W Commerce St., Dallas, Texas 75208. (214) 747-7653. Q: When can I preview the cars? A: Vehicle may be previewed the 1st & 3rd Fridays of the month (the day before the auction)from 10:00 am to 7:00 pm and 1st & 3rd Saturdays at 10:00 am before the auction. Q: Can I get a list of cars for the next auction? A: A list is available on the 1st & 3rd Fridays. You can get the list by coming to our location (copies will be left on our gate for after hours), fax, email or by visiting our website. Q: Can I transfer my own title? A: No, Trinity Public Auto is a licensed dealer and all vehicles purchased by the public are transferred into your name by Trinity Public Auto. "We do all of the work so you don't have to!" Q: How can I pay for my car? Q: What if I didn't bring enough money with me to pay in full the day of the auction? A: You must put at least 25 percent of the balance due down before leaving the Auction Company's location. You may pay the balance the next banking day after the auction. Q: Can I take my car if I still have a balance due on my bill? A: No. You must leave the vehicle at Trinity Public Auto Auctions sale site until the vehicle is paid for in full. The Auction Company is not responsible for damages to your vehicle. Q: Can I get a good deal at your auction? Q: What do I need to come to your auction? A: Anyone can attend our auction for free. If you want to bid on a vehicle you must register at our office before each auction. You must be at least 18 years of age, have a valid drivers license, state or US government issued ID, or a passport. You must put down a $200.00 CASH deposit that will apply toward your purchase (refundable if you do not purchase a vehicle). Q: Can I purchase more than one car? Q: Where do your cars come from? 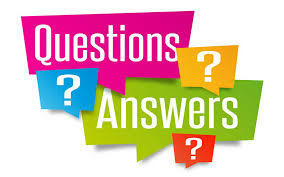 A: We obtain vehicle from Charitable Donations, Bank forfeitures, and Consignments. Q: Are there warranties available for the cars? A: All vehicles are sold "AS IS, WHERE IS, WITH NO WARRANTY OR GUARANTEE". Q: Can you finance my vehicle? A: Not at this time. If you have a financial institution that will finance a vehicle for you, we do work with them to make your purchase go as smooth as possible. Q: How long does the auction take? 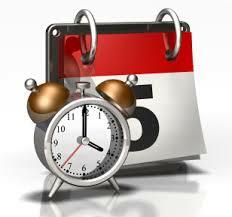 A: Our auction lasts between 2 to 3 hours but it takes only 2 to 5 minutes to sell a vehicle. Q: What happens if I don't want the car I purchased? A: Once the auctioneer says "Sold" and gets your bidder number you are required to pay for your purchase. If you choose not to, you will loose any money you deposited towards your purchases. Remember, if you buy more that one vehicle, you must pay for all of those vehicles. Q: What if I purchase a car with a bad motor or transmission, can I get my money back? at an auction you assume the risk when you make a purchase. All repairs are your responsibility. Q: Can I sell a car through your auction? A: Yes, you can sell a vehicle through our auction. The title must be in YOUR name. The vehicle must be at our location (241 W. Commerce St., Dallas, Texas 75208) by the Tuesday before the auction. You must be 18 years of age to sign our consignment contract. Q: Can I donate my car and get a tax receipt? 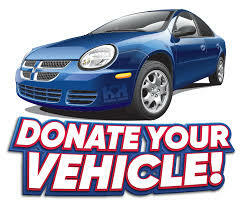 A: You can donate your vehicle to a non-profit of your choice. Go to our "Support Local Charities" page to see and contact some of the non-profit organizations that we work with. Talk to your accounting specialist or the non-profit of your choice to find out information about any tax related information you may need. D- What is a Buyers Premium? A buyers premium is a fee charged by the auction company. Trinity Public Auto Auction adds the sale price of the vehicle sold and the buyers premium together to calculate the total sales price of the vehicle purchased. 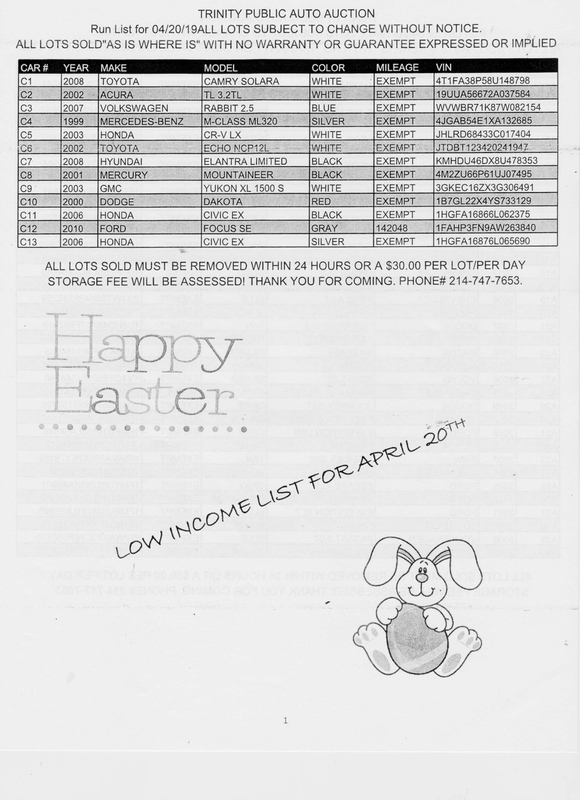 EXAMPLE of a Sale including all fees. What is a Buyers Premium? Posted 09/13/2018 in F- Donate you car! F- Support your favorite Non Profit, Donate your! G- Want us to sell your car? WE ARE NOW TAKING CONSIGNMENTS! 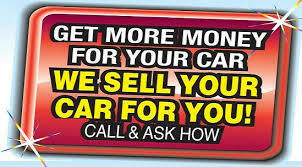 LET US SELL YOUR CAR FOR YOU!!!! CALL 214-747-7653 FOR MORE INFO. *Vehicle must be in your name (Name must be on front of title) and be present to sign contract. * You must own your vehicle free and clear of any liens. *Vehicle must be able to run and drive. 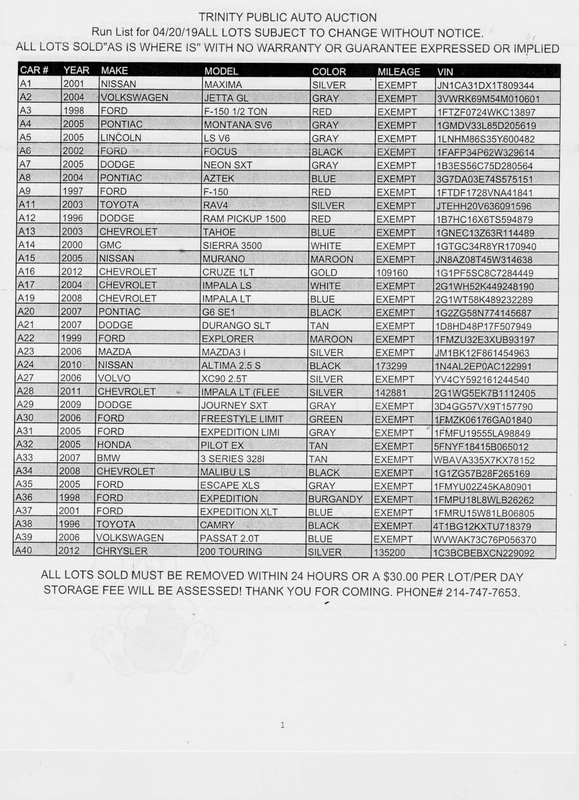 *Vehicle must be on lot Tuesday prior to auction, call for availability. *You will need to bring keys, title and vehicle at time of consignment. *Owner is able to place a minimum/reserve for contracted vehicle. *Fees are as followed: If it does not sell it’s $65.00 run fee/ if it does sell it will be 15% (fifteen percent) of the sale price. *Vehicle must be in their name (Name on front of title) you must be present to sign contract. *Contract is valid for 60 days. *Owner will need to pay a non-refundable fee of $99.00 at the time of the consignment. "Fee we cover the cost of TPAA, LTD obtaining a Carfax on your vehicle, washing the exterior and vacuum the interior and taking the needed Photographs to list your car online"
*Vehicle must be in running condition. *Vehicle Safety Inspection must be no more than 60 days old from date of consignment. *Owner must have and maintain insurance on their vehicle for the duration of the contract. *If the vehicle sells we will take a fee of 15% (fifteen percent) and Owner will get the balance. *Owner is able to set a minimum price to sell.